Do You Need to Replace Your Rooftop HVAC Unit? Unfortunately, all HVAC models will begin to fail when they get past a certain age, including rooftop HVAC models on your building. 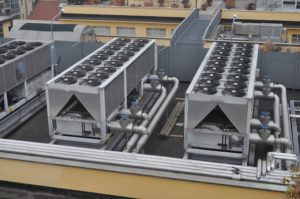 Let’s suppose that your commercial building still has the same rooftop HVAC unit that was installed when the building first opened ten years ago. Unfortunately, all HVAC models will begin to fail when they get past a certain age. Here are some tips for how to tell when you need a new rooftop HVAC unit. Like all old and outdated equipment, it’s entirely possible that your HVAC isn’t as energy-efficient as it could be. Still, that doesn’t need to be a problem. Repairing, replacing, or upgrading an HVAC unit starts with assessing its current condition. If your unit is too large, that can be just as problematic as it is too small. Likewise, the fan could always be running, subjecting your employees to noise pollution. Because of this, you might start to notice multiple operating problems coming up all at once. Technological advances have made newer units quieter and more efficient than their older counterparts. One way to decrease any operating problems is to follow through on all scheduled maintenance appointments. You might see it as just another expense, but preventative maintenance can keep your rooftop HVAC unit running smoothly until you’re able to afford a replacement. Postponing necessary repairs is never a good idea. Besides, if the air ducts are leaking, that could negatively affect the indoor air quality of your building. With cold and flu season on the way, you want to be sure that everyone in your building stays well. It’s understandable if you want to keep costs down. A small business needs to do more with less, a reality that isn’t as much of an issue for larger companies. That said, if preventative maintenance is done incorrectly, it can cause more problems than it solves. If it turns out that it’s more cost-efficient to get a new system than to retrofit old ones, then that is what you should do. A newer system will probably end up saving you money on energy costs down the road! This entry was posted on Friday, September 14th, 2018 at 4:04 pm. Both comments and pings are currently closed.